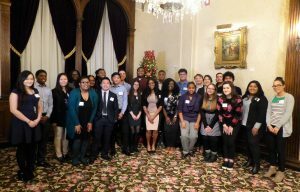 On January 5th the RCM Scholarship Committee hosted its annual brunch at the Pfister Hotel. Scholarship recipients in attendance were joined by their parents/guardians, mentors, RCM Board of Directors, and the RCM Scholarship Golf Classic Committee. Together they celebrated and shared experiences from the last semester. They were also offered suggestions for managing finances during college with by guest speakers from North Shore Bank and Mount Mary University. Those of in attendance were truly wowed by the scope and impact of the RCM scholarship program as it currently provides critical assistance to 24 students at 13 universities, most of whom are the first in their families to attend college. To get involved, please contact RCM Scholarship chairs Margaret Crawford or Jon Dehlinger.